Judging from today’s tweet (shown above) things have changed. Whatever the reason, the disconnect in direct communication illuminates the differences between Canadian and US corporate approaches. The eccentric, combative American CEO uses his personal Twitter account, while the Canadian company follows a longstanding tradition of responding to spats via its corporate blog. 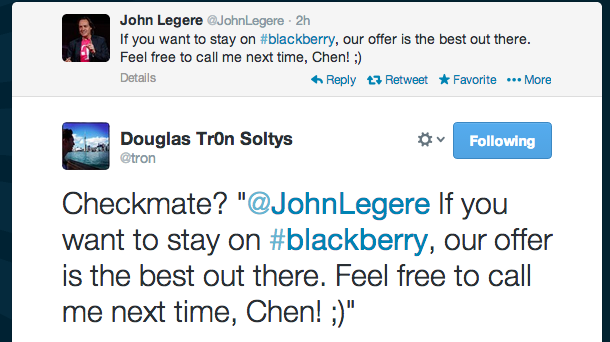 John, we know you love Twitter, and it’s a shame that Mr. Chen isn’t on Twitter. But if you wanted to get ahold of him, why not try leaving a comment on his blog post? 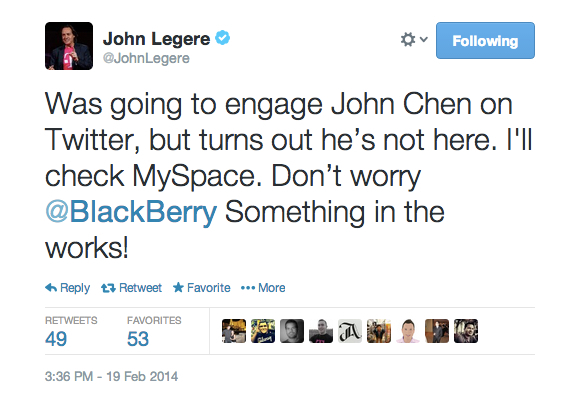 If this escalates we may have to petition BlackBerry to create a Twitter account for John Chen so he can respond in real time.